After the reissue of "Catastrophe Ballet", the next step in the re-release of CHRISTIAN DEATH' back catalogue is gothic classic album "Ashes" (1985). 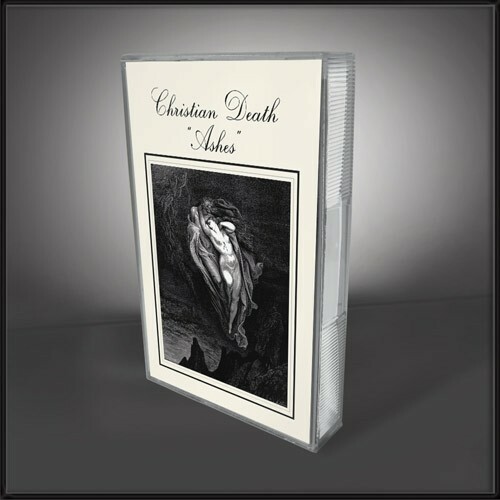 With "Ashes" CHRISTIAN DEATH played again a major role in the development of this subculture and set once more the artistic standards for generations to come. This astonishing achievement was accomplished by the now perfect balance between the two main protagonists of this group. Late singer and band founder Rozz Williams honed his charismatic vocal approach that combined melancholic singing in the vein of LOU REED or DAVID BOWIE with his distinct rhythmical recitative and wailing lament. Guitarist and singer Valor Kand delivered a disturbingly dark and deeply atmospheric songwriting, which to this day raises the hair on the back of the necks of his listeners. “Ashes” continues the Armageddon theme of Valor’s previous band POMPEII 99 and the interest in Dadaism and Surrealism displayed on “Catastrophe Ballet”, while adding an experimental pinch of the truly insane. This is represented within the restored artwork showing photos of early 20th century mental patients as selected by Rozz and compiled and arranged into the first layout by Valor. The singer and guitarist has also diligently restored the original sound, while carefully enhancing its sound by remastering the album with its integrity remaining untouched. As a very special treat the previously unreleased song “Before the Rain” featuring Rozz Williams’ vocals has been added. A legendary work of art can finally be enjoyed in its full glory as it was originally intended!